The Mercedes-Benz CLA, pictured here, and the GLA crossover will be available for customers in select U.S. and Canadian markets. Daimler AG’s Car2Go car-sharing service just became more luxurious. Car2Go, one of the world’s largest car-sharing services, has added the 2017 Mercedes-Benz CLA and GLA to its North American fleet, starting Monday in Austin, Texas; Portland, Ore.; Seattle; and the Washington, D.C., area. In Canada, Car2Go members in Toronto and Vancouver will be able to use CLAs and GLAs starting in early February. Car2Go did not have an exact number of Mercedes-Benz vehicles that will be added to the fleet, but Mike Silverman, a Car2Go spokesman, noted the number will be in “the thousands” by the end of 2017 as it updates its fleet across its North American locations. In fact, the majority of Car2Go’s North American fleet will be made up of the Mercedes-Benz vehicles by year end, Silverman added. Silverman noted that when Car2Go first started operations in the United States in 2009, its fleet was exclusively Smart ForTwo vehicles. Now, Car2Go is in the process of retiring older-generation Smart vehicles and will be replacing them with either a CLA, GLA or a current generation Smart ForTwo, Silverman said. Unlike the Smart ForTwos in the fleet, which feature an easy to identify blue and white paint scheme, the Mercedes-Benz Car2Go vehicles will either be black, white or silver. All Car2Go GLAs will feature all-wheel-drive, while all CLAs in Toronto and Vancouver will have awd. 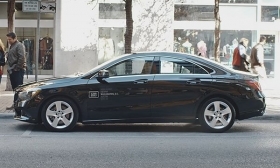 Car2Go’s introduction of CLAs and GLAs follows a year-long pilot program in which the company had 25 Mercedes-Benz B-class vehicles available in Calgary, Toronto and Vancouver for use in each city. Car2Go covers fuel, parking, vehicle maintenance and insurance. Silverman said that Car2Go will work with the Mercedes’ dealership network when servicing vehicles. Rates for the Mercedes vehicles will vary in Canada, where it will cost 47 cents per minute in Toronto and 45 cents per minute in Vancouver. The hourly rate in Toronto will be $19 and $17 in Vancouver. And daily rates will be $79 in Toronto and $99 in Vancouver. The car-sharing service was initially piloted in Ulm, Germany in 2008 by Daimler. The company says it has 2.2 million members across the globe which includes parts of Europe and Chongqing, China, in addition to the United States and Canada.